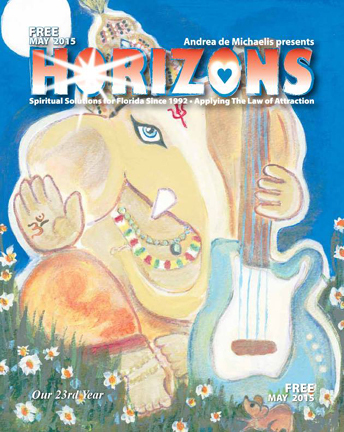 Hello and welcome to the May 2015 edition of Horizons Magazine. Last month I read Sonia Choquette’s Walking Home, about her pilgrimage on the Santiago de Compostela Camino which is a 600+ mile walk across northern Spain to the North Atlantic Ocean, In the book Choquette mentions the Martin Sheen/Emilio Estevez movie The Way. I watched it and was inspired to further learn about those who pilgrimage on the Camino de Santiago. In The Way., Martin Sheen plays Tom, who comes to France to deal with the tragic loss of his son. Rather than return home, Tom decides to embark on the historical pilgrimage on the Camino to honor his son’s desire to finish the journey. It was cool and synchronistic that I found the movie in time to get to see the routes she mentions. Later in the book when Sonia describes the church and the public mass at the end of the Camino, I know exactly the ceremony she’s talking about and get to relive it again. No, I’m not making plans to walk the Camino de Santiago. There are several routes, ranging from 87km (54 miles) to 1,000km (621 miles.) I’m not physically prepared to walk across Spain. A little neuroma on the ball of my right foot acts up after 45 minutes on the treadmill. I’ve got really high arches and if I’d not worn 4″ heels for 30 years, the nerve wouldn’t flame on. And my ankles — as a kid I sprained them all the time. And my knee! Wah! Will you listen to those excuses? I see I’m just not ready yet for my world to change the way the Camino could change it. By that I mean, how I would allow myself to change by surrendering to forces greater than me and to circumstances beyond my control. But I get a chance to do that every day right here where I am if my consciousness was ready. I would only embark upon a trek like that after I’ve done some research and happy pre-paving about it. I just now looked at a globe to see exactly where France and Spain are. I look at maps of the different routes online. Everyone writes about the unexpected cold and rain and mucky trails along the walk, especially the last 60 miles. July and August are very crowded along the Camino, writers warn, and who wants to be in the middle of a gang of walkers, half of them on their cell phones and not walking for the same purpose you are? (Excuses!) It’s suggested April thru June, or September are the best times to walk, since those months are hot or warm. I don’t like hot or humid. More excuses! I’ll find a map and see what temperature and humidity they are talking about. I have no relativity until I have more info. I can see I’m interested and I’m learning more about the Camino every day. That is helping me pre-pave an enjoyable trip, a “Buen Camino,” if I ever decide to go. After reading about the Camino for a month, I bought a FitBit Zip to count my steps. I learned I walk far more each day than I thought. Just walking around the office during a work day I can do a mile and a half. It’s encouraged me to begin waking up wanting to walk right away. I love when that happens. I’m used to walking when it’s dark out, but since I’ve been expanding my territory, I like to wait until daylight so I can see the new sights. I don’t think I’ll be walking the Camino anytime soon but it’s fun to trek around my neighborhood pretending I’m crossing the Pyrenees. There’s not much traffic on the blocks I walk, unless I choose to wander out onto Eldron or Emerson. It is an equal mix of residential homes and wooded lots. Walking the new route at daybreak, I get to observe the wildlife at the edge of the woods out at the road. Bunnies, armadillos, opossum, raccoons, turtles, squirrels, birds, bats, snakes, lizards, butterflies, dragonflies. When I’m walking in new territory, I notice I can walk longer. Maybe that’s because I’m allowing myself to be invigorated by my own excitement of the new sights. The new sights and sounds set up new thoughts in my mind, and those new thoughts replace whatever self-talk I had going on. When I began, my left ankle had a twinge and my right knee as well. By the time I’d walked a few minutes, both stopped. I walked farther than previous, so I was aware of my shins getting a workout. I have several pairs of walking shoes, so was surprised to find my pair of $8.00 padded flip flops feel the best walking the pavement, better than my Asics or my ultra padded Timberline hiking boots. The walking is like a moving meditation and is becoming part of my daily spiritual practice. Just wandering around new neighborhoods, I did two miles twice one day and four miles the day before. Four miles! I wouldn’t have begun the walk if I’d have known it was four miles. Until I measured it later with my car, I thought it was two. Afterward, I drove the route to Bayside Lakes Boulevard and it was four miles round trip. I can’t believe I walked that without knowing it. My own thoughts and beliefs would have limited me and prevented me from beginning, but my thought and expectation that it was just two miles allowed me to do it with ease. As always, what I expected and believed to be true came to pass. Cool how that works, huh? I spent time that weekend clearing the trails in my woods . After this final part of the land has been cleared, I began making the official trail to walk all around the property in a wooded setting. I cut back the grapevine I’d let overtake the giant oaks over the firepit area the past ten years. Most of the strands I cut were about as big around as my thumb, but some were as big as a garden hose, some twice that thick. When it gets close to the ground, such as the thicket I was in, it sends strands out into the earth, which all have to be cut with the big pruners. Think of a 100 foot long garden hose that has been dropped all tangled up onto the ground where it began taking root while the bushes and trees grew over it, dropping dried leaves and dead branches over it for ten years. What I did was, a section at a time, cleared the dried leaves and dead branches to expose the tangled ropes of grapevine on the floor. Then I took my giant pruners and cut the grapevine into sections I can liftout and sweep the forest floor clear enough to wind the trail over. I walked the route several times, so I now have a one mile trail on my own property under the cool canopy of the tall oaks and pines. It’s important for me to have private space to be alone with my thoughts, and being in motion in nature at the same time. Sometimes I need to stick close to home, and this way I can go for a long, fun, wooded walk in my own yard. I’ve learned to make my home and property a sanctuary that is beautiful to look at, since I will be living there. Oh, it may not be beautiful to everyone, but it’s beautiful to me. I am at a place in my life now where I am completely loving what is. Not loving “what is” will always cause suffering according to Byron Katie. This entry was posted in Uncategorized on May 1, 2015 by Andrea.